Process Navigator has been designed to enable client and industry specific customisation of the mapping capability in a straightforward way. The symbol sets, captured data and even part of the process mapping logic engine can be customised. Every Activity, Deliverable and Node on a Process Navigator diagram can store data, and the definition of the data to be stored is contained in an XML file. 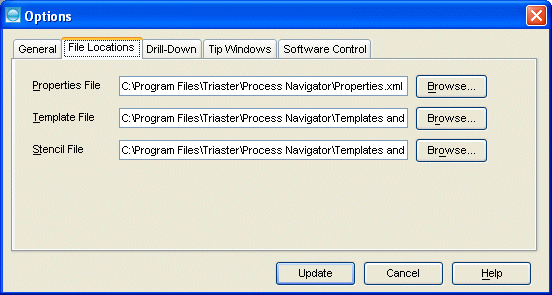 By default, this file is installed to C:\Program Files\Triaster\Process Navigator\Properties.xml. To edit the XML file really is straightforward using any text editor such as Notepad. Just make sure you have a backup copy before you start! TIP: When you upgrade your software, the Properties.xml file will be overwritten, so please ensure that you save your Properties.xml file as a different name to avoid losing your customised changes to the file. The location of the XML file is available by right-clicking the drawing page, selecting Options, and then the File Locations tab. You will see the dialog below. To edit the Properties.xml file, open Notepad (Start > All Programs > Accessories > Notepad). Browse to the Properties.xml file which, by default, is located in C:\Program Files\Triaster\Process Navigator\Properties.xml. When the Properties.xml is opened in Notepad, it is from this point that you can change the contents of the XML file. NOTE: Remember to save your Properties.xml file with a new name to avoid the file being overwritten during software upgrades. groupName is any unique string within the XML file, and groupCaption is the string displayed in the properties tab. NOTE: The groupName must have a unique name in the file and must not contain spaces. Also, </group> tag is required at the end of the group. Note how the </group> tag closes off the group definition. This is compulsory. NOTE: The rowName must be unique so it must not be duplicated anywhere else within the XML file. NOTE: If you are going to use the Export to Microsoft Project 2003 feature, ensure that the rowName=“TotalEffort” is not modified otherwise the export of duration is not carried through. rowCaption is the row name as displayed in the Properties tab. 0 - String value - a basic text edit field is displayed. 4 - A check box. This is an alternative to having a drop down list of True and False values. 5 - A date control to enable easy input of dates. 6 - A Spin Control (select an integer). 7 - A time edit control to enable easy input of times in a 24 hour clock format. 8 - Enables hyperlinks to be used. 12 - A colour selection control. Whatever data-type is used, they are stored as strings in Visio's ShapeSheet to ensure portability across different applications. Once you have made the changes to the XML file, save the file in Notepad and re-enter Process Navigator. You will find the changes you have made by right-clicking the shape and selecting properties and then the Properties tab. TIP: When changing the properties of a Node, it is recommended that properties are added to the Node and default properties are not deleted. The reason is that even though the XML properties of the Node itself are changed, the Node will still look for the default properties. In addition, the Node version bar will not reflect the new changes and will only display the default properties. Once you have created a customised properties file that you would like others within your organisation to use when producing their maps, you can store the file on a shared network location. Other users can select this file by right-clicking the drawing page, selecting Options and then the File Locations tab. In the Properties field, input the new filename. Note that if the network or server is down, then the users may not be able to access the customised XML file. Report format (look and feel) can be customised by specifying a new style sheet file, or by changing the existing style sheet. Content can be altered in some reports by modifying the Properties text file. Style sheet modification is beyond the scope of this manual and is really for skilled HTML publishers only. The Properties.txt file is a simple 3 column, comma-delimited, text database file. Column 1 gives the name of the property to be reported on as found in the Properties.xml file. Column 2 gives the name of the property as it will appear in the report. Column 3 gives the name of the report it will be in, e.g. Activity Metrics is the Metrics report found from Reports > Activity > Metrics in Process Navigator. NOTE: The names in column 3 are fixed and cannot be changed. However, the content of these reports can be changed as mentioned above. Process Navigator’s stencil and template can be customised to integrate corporate colours or include new or altered shapes to fit the requirements of an organisation. Note: This can be quite complex involved work. Therefore we are unable to support any customisations done by customers. If you would like some sutomisation work done, please contact Triaster’s Customer Success Team on +44 (0)870 402 1234 to discuss your requirements.